The autobiographical excerpts of Sky Lea Ross's life, as well as educational pieces in the realms of Mental Health and Feminism/Social Justice. 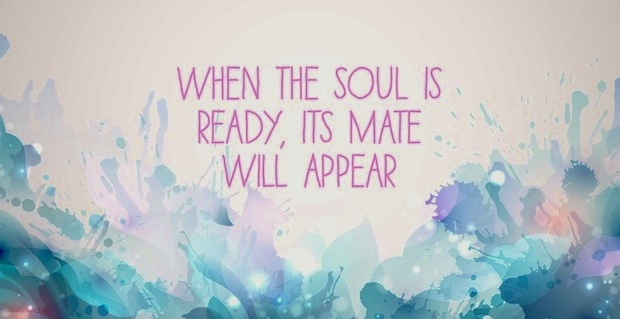 Soulmates; Do You Believe in Fate? A few weeks ago, I was staying up late and having a stimulating conversation with my dear friend America, and she asked me, "Do you believe in fate?" She went on to tell me about a person in her life who she felt very connected to, and this connection was quite unexpected for her. One of her nicknames had matched this person's last name, and all of the dots were connected. A strong bond between her and this person emerged and her life has changed ever since, for the better. "Well, I don't know. 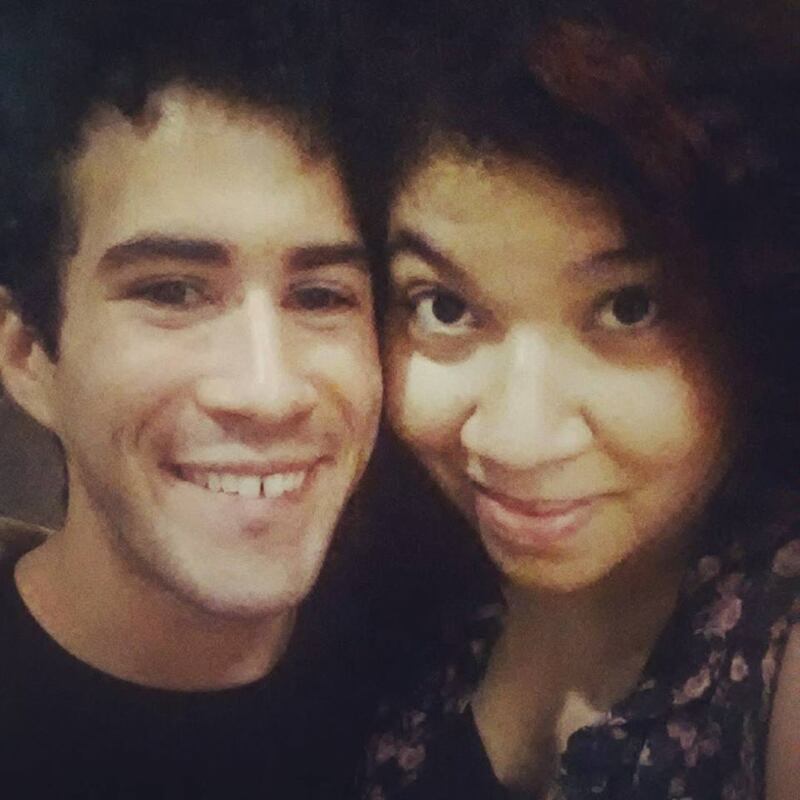 Look at me and my boyfriend: We're both mixed. We're both Aries. We're both studying Psychology and going into Therapy. We're both avid Writers. You tell me what that means." Before meeting Satchel, I had been reluctantly single for 6 years, and desperately looking for "the one." (as you might know from reading my previous blog posts) I had periods of time where I gave up looking and became somewhat content being by myself and other episodes where I felt so unwanted, unloved, unappreciated, and doomed to be forever alone, that I went hysterically searching only to find disappointment, rejection, heartbreak, and several slaps in the face by reality. Like my friend Jennifer understands, I genuinely thought that I might never find anyone to spend my life with because of my struggles, experiences, and upbringing. I thought I was damaged goods, high maintenance, broken, unattractive, and damned to live my life on my own, not relying on anyone else, individually, and independently. But now, the wait is over, and I don't have to look any more. The curse has been broken. The plague of loneliness is cured and gone! I changed my mind and decided to start using the site again after my friend Vanessa met someone. This inspired me, and so I reactivated my profile after 3 years of it being left behind and forgotten. I went back on OkCupid with my hopes and expectations low, not really thinking I'd meet anyone, but they also say God works in mysterious ways. . . Though I met a lot of weirdos and men from distant countries dying to marry me most likely for a greencard, I met Satchel after 1 week of being back on the site! Upon meeting Satchel, I immediately recognized his name and thought we had met before, but he didn't remember, so I thought maybe it was someone else. 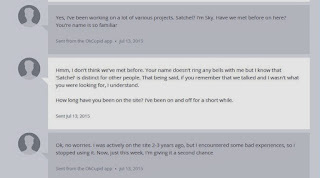 A tidbit of our conversation on OkCupid. Please forgive my spelling mistake! Yikes! 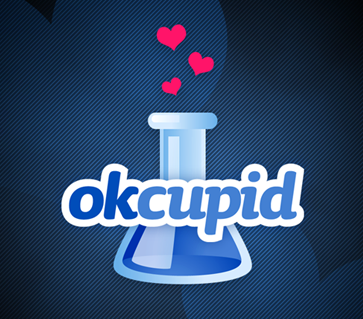 Much later on, and deeper into our relationship, I went back on OkCupid and did some digging. I read through all of the 119 messages and realized that it was him! The same exact person, just under a different account! And if you look at the dates, you'll see that we met initially in July 2012 and found each other AGAIN in July 2015, exactly 3 years later!!! We just lost touch because he deleted that original account and I deactivated mine for the 3 years before I returned to find him again! As everyone has been telling me, it's meant to be! I couldn't wipe the smile off of my face when I first found this information, and I couldn't wait to surprise Satchel with the news! We were both so amazed and it brought us even closer! 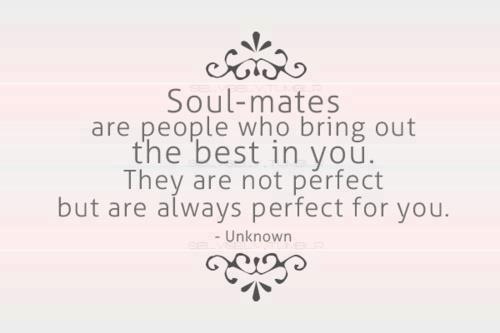 I remember just a couple of months prior, we were cuddling in bed, and I told him, "I think you're my soulmate." And he responded, "I am!" while flashing me the cutest, most adorable smile. I know we are both young and still in the early stages of our romance, but he has been there for me through extremely tough times and I trust him with anything. It's something I feel in my heart, I know in my mind, I sense running through my veins, I breath in and out, and I see within our happiness. 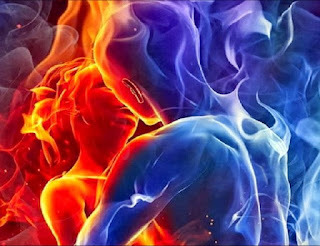 We complete each other perfectly though we are both imperfect, we better ourselves by being together, we provide one another with what we lack, and we love each other in the ways most wanted, needed, and yearned for. So, you're probably thinking and wondering, "Good for you! Now how do I find mine!?" Well, let me tell you. More elaborately put, this mantra is explored in Don Miguel Ruiz's powerful book, The Mastery of Love. An important point he emphasizes is that we do not obtain happiness from outside sources, but through ourselves and our ability to give and share our love with others. 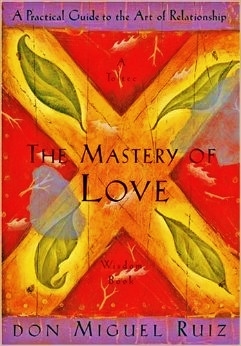 The Mastery of Love by Don Miguel Ruiz, a MUST read for anyone looking for love! 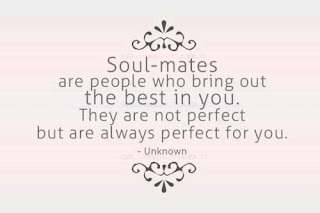 How do you find your soulmate? My advice to you is truly learn to love, embrace, and accept yourself, flaws and all. (ESPECIALLY your flaws.) It's not something you can achieve overnight, and it doesn't just happen in a day. It's a continual process that's never-ending. Whatever you dislike about yourself, change. Perpetually improve yourself and learn to be content with, confident in, and proud of your talents, skills, appearance, qualities, personality, world perspective, identities, attitudes, emotions, thoughts, and livelihood! And never lose hope! Another friend I know asked me, "Do you think I'll ever find love and get married, even at 63 years old?" I told her anything is possible, if she truly believes and works on loving herself. 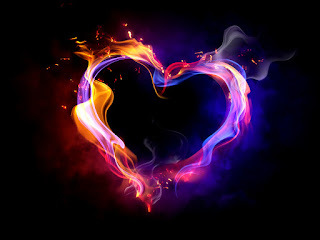 When the time is right, love will find you. I know that now, and I want everyone to know it too! I waited 6 (almost 7) long years, I had given up hope, grown tired, and I thought no one existed who could or would love me. But I was wrong, and when I realized that, I found a love I never imagined I'd ever have, but always dreamed of and prayed for. So let me be an example to you that it can, does, and will happen! Now, it's half of a year into our relationship, making it the longest and healthiest relationship I've ever had in my life. I don't know what the future holds for us, but I have high hopes, and I am fulfilled knowing that he will be by my side. 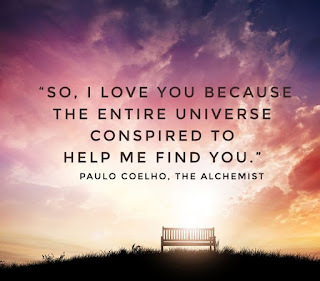 If you've taken anything away from reading this, I hope it's that you must keep the faith, continuously work at loving yourself, and, naturally, finding your soulmate will follow. Let me and my story be living proof of this. I am happier than I've ever been in my entire life, and I know it's because I learned this valuable lesson, and I hope you will too. 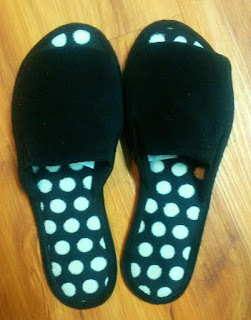 Have you ever had something odd, weird, or strange happen that seemed like it was meant to be? You connected with someone silently, almost like you've read each other's minds, and the outcome seems so perfect that it's almost implausible!? I'm talking about MORE than just finishing each other's sentences! MORE than just being caught wearing matching outfits or colors! Well, lately, I've witnessed a lot of freaky coincidences that I have reason to believe are MORE than just coincidences! 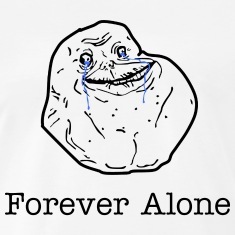 1) I was having dinner with my boyfriend, (And YES, I FINALLY have a boyfriend, AT LAST! Blog post ALL about this coming soon!) we decided to get Chinese, and I happened to get a fortune cookie that read "Wise men make more opportunities than they find." I have always gotten fortunes that make accurate predictions and even remark on present occurrences as I break the cookie to read them, but this one was especially unusual, because I had just been thinking of possibly starting my own business. Maybe this is a sign! 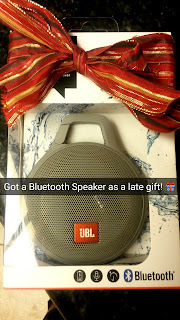 2) My boyfriend and I had our gift exchange on the Wednesday before Christmas Eve because we knew we would be with family for the rest of that week/weekend. One of the AWESOME gifts he bought me was an Oracle card deck, which is very similar to a Tarot deck, but more flexible in its structure. I loved it and insisted we do a couple of readings. Well, before we did, I looked through the entire deck and felt very drawn to 2 cards in particular. 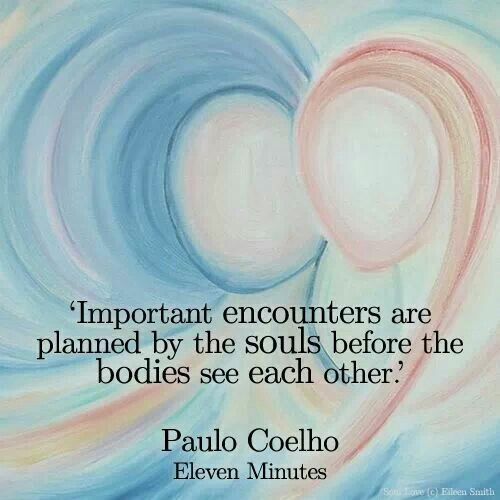 Their names were "Lovers" and "Hidden Beauty." Even their art work resonated with me. When we did a reading specifically about our relationship, sure enough, we happen to get those 2 exact cards juxtaposed together!!!! We shuffled the deck and everything, so it was not our fault! I thought it was wickedly cool! The "Lovers" and "Hidden Beauty" cards right next to each other, the last 2 cards of our reading, signifying the purpose of our relationship. So mysterious and promising! 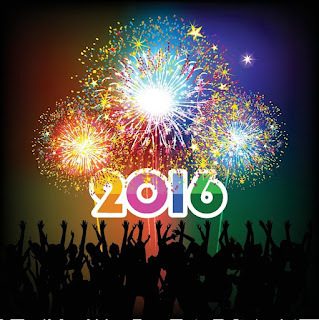 3) Christmas Eve was a breeding ground of psychic activity! My cousins and I traditionally open our gifts at 12am on this night, so we came across a lot of pleasant, unplanned surprises! It seemed as though all of the gifts we got for each other just magically seemed to fit our expectations or needs without us even knowing beforehand! First off, as a few small prizes (that's what we call them), my cousins got me a box of glazed Honey Buns and a box of Nutty Bars, which are two of my favorite snacks, but I was just with my boyfriend in the store a week beforehand and I pointed at these exact two treats and told him, "My cousins will probably buy these for me." Sure enough, I was right! Yummy glazed Honey Buns, courtesy of my cousins! 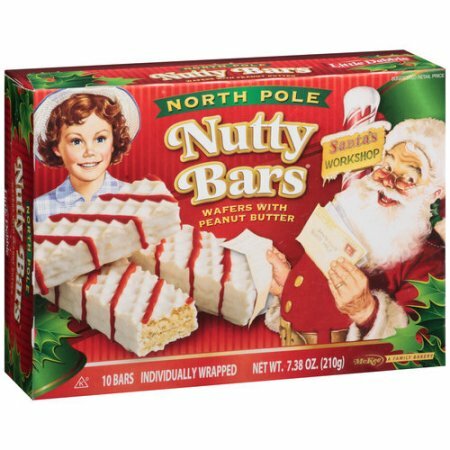 Nutty Bars, one of my ALL time favorite junk foods! So creamy and delicious! And this box is Christmas edition! 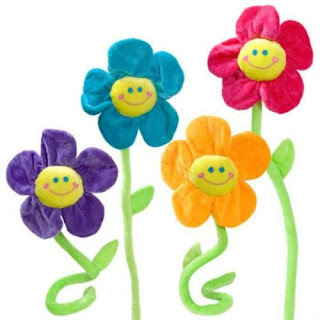 I bought my cousin Dawn these 2 happy daisy stuffed flowers as a reminder of an inside joke, and one of them was the exact color as the one she originally had, which I had no way of knowing! I bought Dawn the 2 on the right, Orange and Pink, and she had the Pink one before! 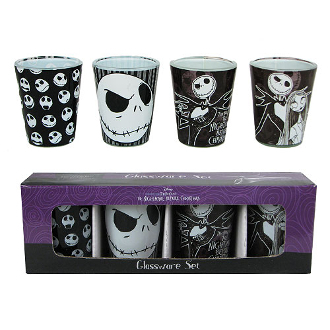 I bought my cousin Cherie a set of "The Nightmare Before Christmas" shot glasses, and little did I know that our friend Hannah had the exact same set and Cherie had been wanting it! Nightmare Before Christmas Shot Glass Set that I got for Cherie. Knew she loved the movie, but didn't know she wanted these! 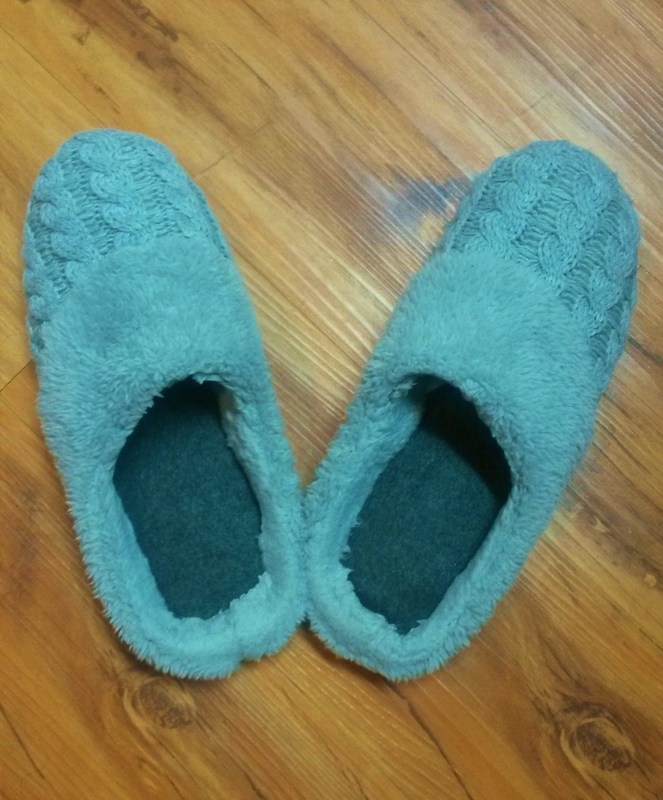 They both got me a pair of warm, comfortable slippers and I had just thrown away a pair of mine that were too worn out! They weren't aware of that! It was like we were all on the same psychic page, our instincts and intuition led us to picking the perfect gifts for each other! The creepiest part of that night, by far, was when I opened the biggest gift that my cousins got me. It's our tradition to wrap each other's presents a million times so they take forever to open, and sometimes we even include funny notes, jokes and/or drawings in between the wrapping papers. 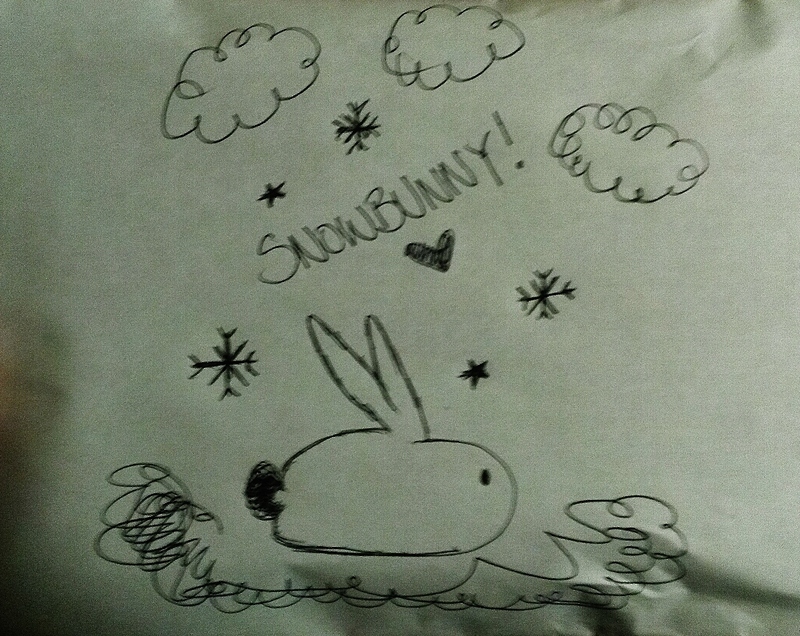 One of the pictures that Cherie drew was of a Snow Bunny. If you're not familiar with what the hell a "Snow Bunny" is, it's an item in the 2004 Nintendo game Paper Mario; The Thousand Year Door for GameCube. About a week prior, I had been talking with my boyfriend, Satchel, about video games. 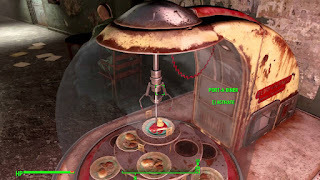 He told me that he was playing Fallout 4 and apparently there's a rare piece of cake stuck in a machine that you can somehow get if you try hard enough. So, he stole it and managed to actually get away with it! Satchel's story reminded me of me and Cherie playing Paper Mario back when we were younger. We sought after that pesky little "Snow Bunny" for DAYS! We tried so hard to get it because it was so hard to find! The game has recipes where you can cook food that can give you special benefits, and we wanted to make this "Couple's Cake" which required a "Snow Bunny" to execute, so we even went online for cheats, hacks, and hints, but had NO luck! So I told Satchel this, and sure enough, on Christmas Eve night, I unwrap a gift with Cherie's adorable drawing of a "Snow Bunny" when she had no idea that I had this conversation with Satchel a week prior! Cherie and I haven't played the game in years or brought the "Snow Bunny" up in any recent conversations, so how the hell does that happen!? 4) On Christmas Day, my Aunt Robin ALSO got me a pair of slippers! How the hell did they know I had just thrown my only good pair in the trash? I hadn't told anyone! 7) Satchel and I are both Psychology majors, so we're really interested in Astrology and Myers-Briggs/Jungian personality types. We've taken multiple quizzes and everything. He's an Aries INFJ, and I'm an Aries ENFJ, probably why we work together so well. I'm basically just the extroverted version of him! We happened to be watching one of my favorite Youtubers, Autumn Asphodel, and she has a video where she talks about being an Aries INFJ too! No wonder why I felt so connected to her! 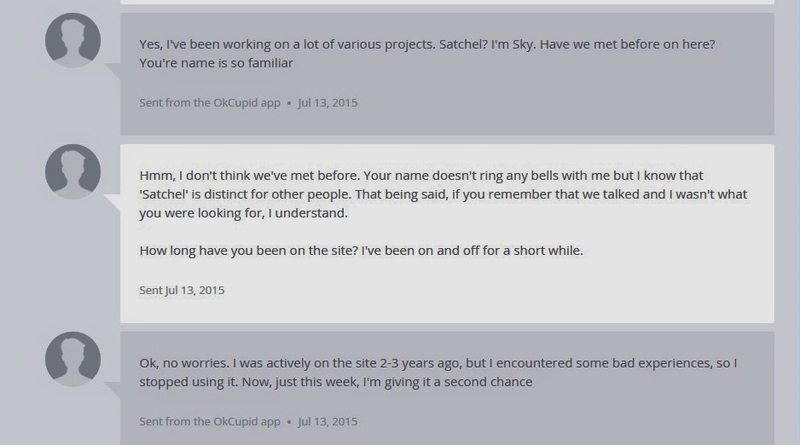 She has videos about her negative experiences on OkCupid, and this made me think of my own experiences with the dating site. I logged into my old account that I don't use anymore and realized that a girl I had been talking to was ALSO an Aries INFJ! What are the odds!? 8) This past Tuesday, I was grabbing dinner and a few drinks with my bestie, Marigold, and I told her about all of these psychic phenomena happening to me this month. She said it might be due to the moon, especially since it was so full during Christmas! We exchanged gifts we had for each other, and being the amazing friend she is, she got me a Tarot card deck, knowing that I really wanted one! (Long story short, I was @ Dave & Buster's playing games, I won over 4000 tix just so I could get a Tarot card deck to learn that they had discontinued them! I was so bummed! So thanks Marigold! And thanks Satchel for my super dreamy Oracle deck too! Y'all are the best! :-*) We decided to do a few readings for fun. The first one we did was a career one for her. She flipped the first card over upon my request, and so I went to the handy dandy guide to read what it meant. Never having touched the booklet before, I accidentally flipped to the right page! What the heck!? Later that night, I caught the train home and as I got off of it, it had an advertisement that read "How do you innovate?" One of the cards from a reading we did earlier that night told me to be more innovative! Freaky, right?! So, I bet you're wondering, what did I gather from all of these incidental occurrences? Well, I think they're all a good sign. I believe in a higher being, our creator, and karma. When you do good, it comes back to you, tenfold. Look at all of us in this post: my boyfriend, my cousins, my Aunt Robin, my Grandpa's wife Julie, and my great friend Marigold. 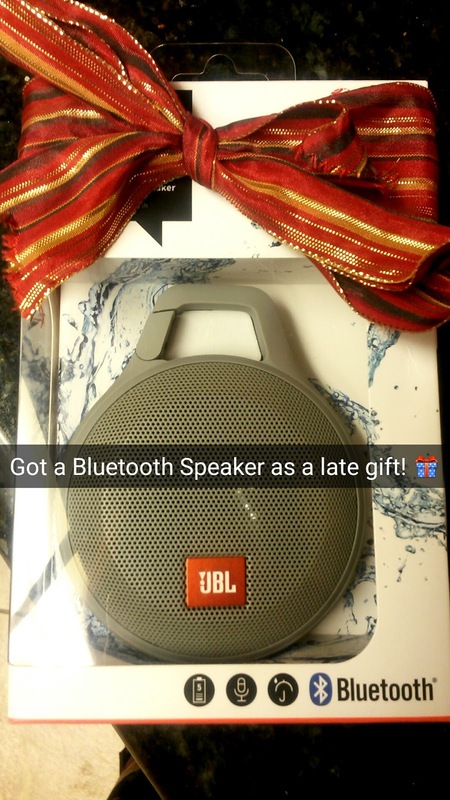 We all opened our hearts to give thoughtful gifts to one another, and it paid off! 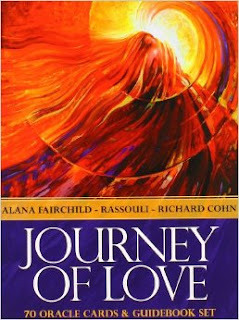 We were all psychically linked in this unexplainable way that allowed us to be on the same wavelengths and pick perfect presents for one another as well as have insightful intuition about the world around us and what was happening. Isn't that powerful!? It goes to show if you truly open your heart, share your love with others and give, you will be greatly rewarded! So IDK if this "Psychic Apex" will continue onto 2016, but I'm very grateful for it's appearance in my life this last month of 2015, and it's a wonderful way to start off the new year! My "I am" Poem: I am what comes from fantasy but made into reality. I am the shade of gray, a constant contradiction. . . I am the epitome of difference and diversity in the face of adversity. I am the shade of gray, a constant contradiction. . . I am an anomaly, an enigma working to fight the stigma. I am the shade of gray, a constant contradiction. . . I am a hybrid. A duality, multiplicity the symmetry between polar opposites the product of composites the two extremes with their distinct esteems. I am the shade of gray, a constant contradiction. . . I am what’s feminine and masculine the spirit of both held within the essence of passion the emphasis of action immense affection purity and imperfection intense sensuality the purpose of ambition. I am the shade of gray, a constant contradiction. . . I am sensitivity morphed into creativity. Perseverance and deference and a natural guardian. A protector and provider and a warm and avid writer. I am the shade of gray, a constant contradiction. . .